To those of you who shoot film…I salute you. 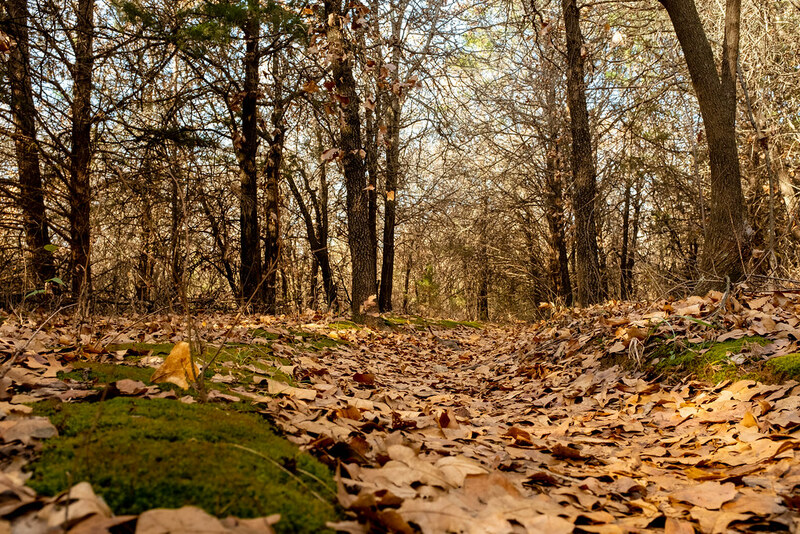 I took this photo this when my wife and I were on a walk at Arcadia Lake just northeast of Oklahoma City, and as I knelt down on this leaf-strewn path I thought about my buddy Ryan who has taken some absolutely breathtaking images similar to this, but with a lot more mountains and water, using nothing but a light meter, some math, and a film camera. I had no such tools at my disposal and instead went with a decidedly modern approach: I shot this with my Fuji X100F which, despite looking kind of like an old-school film camera, is all ones and zeros on the inside. And as such I let the camera take care of all the heavy lifting. I was using Auto ISO with a minimum shutter of 1/125 and shot the first version of this at f/4 which, thanks to the ability to see the final image on the LCD screen on the back of the camera, I realized had a depth-of-field that was much too shallow. So I dialed in an aperture of f/8, focused on the tree halfway down the path, and took the shot you see here. Then when I got back to my computer I used Lightroom to edit the RAW file to my taste. The entire process was digital from start to finish, and while I’m certainly happy with the results I wonder what I would think if had shot this on film. Even something as simple as nailing the exposure would have been difficult because of the mix of highlights and shadows, and I almost certainly wouldn’t have gotten the composition to look how I wanted with the green mossy rock slightly out of focus in the foreground and horizon neatly bisecting the image just above the lower third. Film shooters…you have a tricky job and I appreciate the work that goes into capturing images without a digital safety net.